Prime Minister Benjamin Netanyahu railed at Iran Sunday for holding its annual Holocaust denial cartoon contest, charging that the Islamic Republic was “preparing another Holocaust” against the Jewish people. 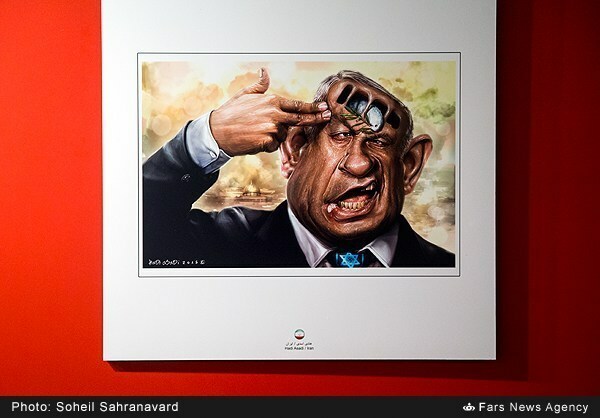 Iran’s annual international cartoon contest lampooning the Holocaust features around 150 works from 50 countries. It began Saturday and is running for the next two weeks. The contest secretary said Saturday it was not denying the Nazi genocide and wasn’t “ridiculing its victims,” but then went on to equate Nazi crimes with Israel’s treatment of the Palestinians. Netanyahu also said that France’s support for a UNESCO resolution that neglected to mention the Temple Mount’s Jewish history casts a pall over Paris’s impartiality in attempts to resuscitate peace talks. He was speaking shortly after meeting with visiting French Foreign Minister Jean-Marc Ayrault. Ayrault traveled to Ramallah to convene with Palestinian Authority President Mahmoud Abbas after his tete-a-tete with the Israeli prime minister. The prime minister said that he told Ayrault that France’s “scandalous decision” to vote in favor of a UNESCO resolution “which doesn’t recognize the millennia-old connection between the Jewish people and the Temple Mount casts a shadow on France’s evenhandedness in any forum it’s trying to convene.” Netanyahu wrote a furious letter to President Francois Hollande last week protesting the French support for the decision. “The only way to advance real peace between us and the Palestinians is through direct negotiations… with no preconditions,” Netanyahu restated. Ayrault is promoting a bid to persuade Netanyahu to accept France’s efforts to engineer a peace deal between Israel and the Palestinians, based on a two-state solution.